Global bulk handling company RBL-REI is closely involved in the port, mining and cement industries, as well as others. With its main headquarters located in Paris and Angers (Loire valley area), RBL-REI has several facilities in France and abroad. It is widely represented throughout the world with commercial agencies which allow it to consider projects of the largest scale. RBL-REI maintains a close relationship with its clients and its partners throughout a project, from the very early stages to the final commissioning. It has decades of experience and unique skills, allowing it to design innovative bulk handling solutions. RBL-REI has the advantage of a reliable, multi-lingual engineering department, and relies on its dedicated teams to develop the associated equipment and services such as PLC, civil work and final assembly. The company has used its skills on specific product ranges, such as the: CurvoducTM, an engineering technology dedicated to overland curved conveyors; the dedusted hoppers for port application; extendable conveyors for TBM application; pile stocking stackers; weighing towers and automatic train loading for any kind of bulk materials including cereals, cement, fertilizers, clinker, aggregates, coal, and more. Among its most recent conveyor contract, in the past five years, RBL-REI has delivered some outstanding OLC CurvoducTM projects. The CurvoducTM conveyors can reach up to 17km per flight, or have a very tight radius of 250m, and with flow capacities of up to 20,000tph (tonnes per hour). CurvoducTM conveyors are characterized by a phase calculation and much more complex design. Calculated results determine the equipment’s reliability in all phases of use encountered during its operation. The calculation software (belt tracking and dynamic calculation), which has been developed since the first Curvoduc was commissioned in 1980, is constantly being upgraded according to the monitoring of the most recent references. The FENGKAY (China) conveying project (twin belts of 40km each which will reach soon 53km in four flights), delivered by RBL-REI, has just celebrated its second operating anniversary. These two side-by-side belt lines, with a flow capacity of 2,500tph, each allow a daily delivery of 30,000 tonnes of limestone to one of the largest cement plants in the world. Each belt line comprises three CurvoducTM conveyors (11km, 12km and 17km), powered by 19 750kW main drives in total, with a belt speed of 5m/s. The curved conveyors ( CurvoducTM) are adapted to cross hilly terrain, roads, rivers and rice fields. In New Caledonia, RBL-REI faced a new technical challenge when it developed an 11km (two flights of 7km and 4km) downhill conveyor for nickel ore, and a handling system that included four 100m3 dedusted hoppers and a stacker with a 50m boom (see pictures below). RBL-REI has increased its presence in Russia, with a remarkable technical challenge. The company has recently commissioned a 5km CurvoducTM conveyor, crossing the Oka River on cables with a 240m span. 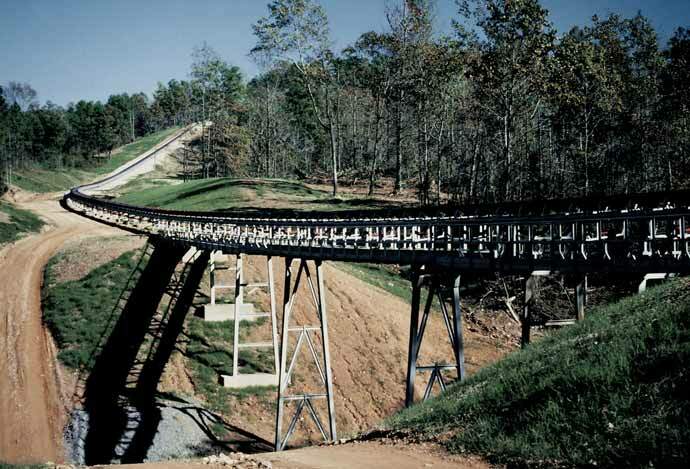 The conveyor transports limestone and clay at 1,100tph between the quarry and the Lafarge cement plant (see picture on p73). The CurvoducTM range also includes very economical technical solutions such as the 6.8km belt conveyor connecting the port to the cement plant. This CurvoducTM commissioned in 2008 and located in TongLing (China) feeds the port with clinker at 1,200tph (on the upper strand) and simultaneously supplies coal to the cement plant at 400tph (on the lower strand). It is equipped with three main drives of 500 kilowatts each. Its layout generates two 1,000m curves. The CurvoducTM also allow paths with very tight curves. A good example is the conveyor RBL-REI supplied to a French customer. This conveyor provides coal at 600tph to a thermal power plant from the barges floating on the Moselle River. With the curve radius of 250m and 300m, the S-shape has allowed the installation of a single conveyor instead of three straight conveyors and two transfer towers. With a 1,200mm belt width, this CurvoducTM of more than 1km crosses a canal and an ash park. RBL-REI is currently engaged with large capacity and/or very technical conveyors in projects in Peru (gold ore), USA (manganese) and Russia (potassium) [see picture on p69] with projects to be commissioned in the coming year. The CurvoducTM is extremely reliable. As proof of its reliability, some conveyors commissioned more than 20 years ago are still performing well without any noticeable failure (KOUAOUA – New Caledonia, Springvale – Australia). RBL-REI DIVERSIFICATION CAPABILITY Due to its wide design capabilities, RBL-REI is able to offer a diverse range of engineering solutions. These include: biomass power plant handling and stocking solutions (for example, at E.ON Gardanne, in France, where it processes 1mt [million tonnes] of woodchips for the 150MW plant); and motorize heap leach conveyors for the dynamic handling of uranium ore (for example,TSU Imouraren in Niger, where it is supplying one heap leach system involving 19 grasshoppers and four mobile machines at 2,300tph). A good illustration of RBL-REI’s ability to integrate multi-purpose bulk handling issue is its recent new 8mt import terminal commissioned for SEA-Invest in Gdansk, Poland (see picture on p73 and below). This EPC (engineering, procurement & construction) project involved the provision of bulk handling equipment for unloading, belt conveying and train loading different type of bulk materials such as coal, ore and aggregates at the Gdansk sea port in Poland. The complexity of this project was an extension on an existing terminal in operation and especially for the automation connections between a brand new supervision system and an 1980s electro-mechanical system. This project includes two unloading and dust-free hoppers fed by two cranes at a capacity of 2,000tph per hopper. The stacking line includes three conveyors with a capacity of 3,800tph and a total length of 1.2km up to the stacker reclaimer. This train-loading station offers a capacity of 2,000tph with a commercial accuracy of 2/1,000 thanks to a static weighing device. From the outset of the project until commissioning, it took 16 months to design, manufacture, erect and start up this terminal. “An anniversary like this gives us the opportunity as a company to look back at how far we’ve travelled, but more importantly, to look ahead at where we’re going. There are a few pretty interesting numbers in our new corporate brochure, launched at the Bauma 2013 trade fair in Munich: in 2012 we produced 340km of hot spliced conveyor belts, enough to reach from London to Paris, and we manufactured over 150,000 CNC cut rubber parts. However, the most meaningful number for me concerns word of mouth and it came directly from our customers: 97% of the 312 respondents to 2013’s satisfaction survey said they would recommend us,” says Vaughan Monroe. Development Unit], we began manufacturing rubber impact bars (for use at conveyor feed and transfer points) in 1994, which led to our first overseas exports to the North America, where we now count a number of major groups amongst our customers. We’re always looking for ways to improve, which is what led us in the late 1990s into forming a lasting partnership with the world-renowned Polymer Processing Research Centre (PPRC) at Queen’s University Belfast (QUB). This was our first real taste of research and development and their expertise was invaluable when it came to setting up our own in-house belt testing lab, another critical investment in safeguarding quality. “Safety has always been my number one priority, so achieving OHSAS 18001 accreditation for Health and Safety Management back in 2006 was significant. We remain committed to raising the overall standards of safety within our industry. So we were delighted to be able to support the Health and Safety Executive for Northern Ireland (HSENI) when they requested our participation in a Safety Day recently, to illustrate safe maintenance and best practice guarding using our portable demo conveyor. when they need it, such as reliable, energy efficient conveyor products — usually delivered just-in-time (JIT) — which has implications right down our supply chain. Reducing waste will not only make a major impact on staying competitive, but form a key part of our roadmap for attaining ISO 14001 environmental certification. To meet these challenges, we’re making our largest investment to date, to create a world class Centre of Excellence for synthetic rubber products — focusing on rip-resistant, chevron and sidewall hot cleated conveyor belts, ideal for handling sharp, abrasive and oil-based materials. “Smiley Monroe strives to be an environmentally, socially and economically sustainable business,” says Vaughan. “I’ve personally always enjoyed supporting cross-community initiatives, especially through sponsorship of local sport. “Economically speaking, we understand that time is money and that anything you can do to reduce downtime and waste, while increasing productivity, is money well spent. In a nutshell, that’s what we believe 35 years’ experience has given us — a unique appreciation of our customers’ specific bulk materials handling requirements — whether you’re handling coal, cement or fertilizer, a mine processing zinc, a quarry producing crushed stone and aggregates or an original equipment manufacturer. And we’re always on hand to provide technical support to help keep your business running, whether you’re in the West of Ireland, the West Indies or Western Australia. Celebrating 35 years in business, Northern Ireland-based Smiley Monroe is recognized as a global leader in the production of conveyor belts and CNC cut rubber parts for the mobile crushing, screening and recycling sector. The company established an operation in India in 2011, as part of its strategic global development, demonstrating its commitment to the dynamic Asian market. In early March, Smiley Monroe is exhibiting at CONEXPO-CON/AGG in Las Vegas, USA — the international gathering place for the construction industries — and has recently exhibited for the second time at EXCON India in Bangalore, South Asia’s biggest construction equipment show, where there was overwhelming interest not only in its core products, but also in new technologies such as Belt Buddy, the rapid repair resin for conveyor belts and industrial rubber tyres. Smiley Monroe’s expertise and experience in bulk materials handling goes right back to 1979 and this has given the company a unique appreciation of its customers’ specific requirements in industries as diverse as quarrying, mining, coal handling, cement works and ports — where it is trusted to help customers meet their targets for quality, safety, productivity and environmental compliance. As it has continued to build its brand abroad, Smiley Monroe has seen exports grow significantly since the global economic downturn in 2009, increasing by a record 123% between Q1 in 2011 and Q1 in 2012. With a growing export sales and marketing team about to number ten, travelling constantly, the company now exports to 40 countries, with a network of distributors spanning Europe, Australasia and North and South America. In fact, 95% of the products it manufactures are exported outside of Northern Ireland, either directly or indirectly. With the company as sole supply partner to many world-class organizations, Smiley Monroe’s conveyor belts and synthetic screen media are performing every day in the toughest applications and most challenging environments. Tim continued, “All in all, 2013 was our most active year yet with trade fairs — exhibiting at: bC India, Mumbai in February; Bauma Munich in April; RWM UK; the first-ever Bauma Africa, Johannesburg in September; the Coaltrans World Coal Conference, Berlin in October; and EXCON India in November. Smiley Monroe takes pride in its reputation as a conveyor belt expert, and it believes its success at home and abroad is down to delivering on this promise of quality, reliability and friendly customer support. Smiley Monroe’s polymer King Rollers have helped customer Irish Salt Mines (I.S.M.E.) to achieve its aim of further reducing workplace noise on an enclosed high speed conveyor at its Kilroot site in Northern Ireland. The 1,200mm-wide, 120-metre-long reclaim tunnel conveyor running at 2.85m/s, which is housed in a reinforced concrete tunnel below Irish Salt Mines’ storage facilities, transfers salt onto the shiploading conveyor. As part of its ongoing efforts to reduce workplace noise, I.S.M.E. asked Smiley Monroe for its suggestions on how this could be achieved in the tunnel. Smiley Monroe recommended replacing existing steel idlers with polymer King Rollers, and since the customer had been using these successfully on its shiploading conveyor for several years, this action was quickly implemented. As sole supplier of conveyor belts and on-site vulcanizing service to Irish Salt Mines for almost 35 years, Smiley Monroe is very familiar with the harsh conditions in which its customer’s conveyor idlers operate. Irish Salt Mines is now using Smiley Monroe King Rollers on all of its surface conveyors, as hanging garlands, drop-in type end supported troughing sets and return idlers. 50% lighter than a traditional steel idler, so it’s easier to handle and can reduce a conveyor’s power consumption by up to 14%. Ultimately this will help reduce the business’ CO2 emissions and operating cost per tonne of material produced. With ever-rising costs in running plant and vehicles, King Rollers can assist energy- intensive operations, from quarries and mines to cement works, in making their sites more energy efficient. Northern Ireland- and India-based Smiley Monroe, celebrating 35 years in business, is the world’s largest producer of highly customized ‘endless’ conveyor belts and CNC cut rubber parts for the mobile crushing, screening and recycling sector. Smiley Monroe conveyor belts and energy-efficient products can be found in bulk materials handling operations throughout the world, where they are trusted by customers to help them meet their targets for quality, safety, productivity and environmental compliance. Netherlands-based Dunlop Conveyor Belting (Fenner Dunlop BV) has been forced to re-double its efforts to make it even more difficult for others to create low-quality imitations of its belts. An increasing number of cases are coming to light where end-users have mistakenly purchased what they believed to be genuine ‘Made in Holland’ conveyor belts, only to find out to their cost that they are not genuine at all. Managing director Edwin Have believes that the best form of defence is attack. Having invested millions in a new, state-of-the-art steelcord production line, expanded production capacity and the latest laboratory equipment for testing everything from extreme cold to ozone plus its own service network in Europe, Africa and the Middle-East, Dunlop has applied the same approach to overcoming the threat of poor quality imitations. Although it will not disclose the precise amounts involved, Dunlop has made a further “substantial investment” in hi-tech water jet cutting machinery to create rubber branding (usually bright yellow) and the statement ‘MADE IN HOLLAND’ that is embedded in the surface of the belt. This has been a natural follow-on to the introduction of similarly bold branding on every form of packaging. “If the belt and the packaging does not say ‘Dunlop, Made in Holland’ then it almost certainly is not the real thing” says Have. Conveyor belt manufacturing has always been a highly competitive industry but in recent years the large scale ‘dumping’ of belting, primarily from Asia — and often of a very dubious quality — has been taking place on an unprecedented scale. One of the problems seems to lie with the fact that, at first glance, industrial conveyor belts all look very similar — big long lengths of thick black rubber! According to Dunlop, it is almost impossible for the untrained eye to tell if a conveyor belt is of the required quality and specification just by visual examination. For example, a belt that has thinner covers than they are claimed to be can quite significantly reduce the selling price. Sadly, in a great many cases, the labelling and certification will appear to be totally the correct specification. Conveyor belt users who believe that they have saved money by buying a belt at a low price per metre are invariably paying a much higher cost in the longer term because the belts wear out prematurely and stretch and tear much more easily than they should do. Dunlop says that 80% of the cost of making a belt is in the raw materials. For major buyers like Dunlop, worldwide prices for compound ingredients are very similar so if the quality of the raw materials is virtually equal there could never be a massive price difference. The labour cost aspect only represents around 13% of the production cost. The real key, Dunlop maintains, is what goes into the rubber compound. Apart from using lower-quality materials in the first place, the single most effective way for a manufacturer to reduce costs is to use calcium carbonate (chalk) to bulk up the volume (thereby reducing the cost) of the rubber compound mix. This has a seriously detrimental effect on the abrasion resistance of the rubber and its overall mechanical performance. Regardless of the supplier, Dunlop’s advice to all conveyor belt buyers is never to assume that the delivered belt is precisely what was ordered. A few basic checks should be carried out before fitting by inspecting the top and bottom surfaces of the belt to see if the manufacturer’s branding can be seen. Measuring the thickness of the belt using a micrometer is also recommended. Especially where fire resistant belting is involved, for even greater peace of mind it is often a good idea to order an extra metre of belt so that it can be used for testing by an accredited testing authority or laboratory. If the buyer is at all suspicious then they should contact the original manufacturer. In Dunlop’s case, the company will either test a sample for authenticity and compliance or, wherever practical, send an expert to the site. The old adage “You only get what you pay for” certainly seems to apply to the conveyor belt industry! The Esch Group is a major designer and manufacturer of rollers for conveyors and bearing related products for the cargo industry. The history of the Esch Group can be traced back to 1954 when Stas BV was founded in the Netherlands and began bydesigning and manufacturing conveyor rollers and tension drums. As the company grew, it expanded into bearing and bearing related products and in 1996 entered into a strategic alliance with Asahi-Europe in order to offer its customer’s extremely high-quality stock bearings and linear systems. Thereafter the company was able to utilize and supply bearings from a large source of products that include aluminium, stainless steel and plastic. During the transition period Stas BV invested heavily in new automated production systems. This resulted in improved quality and efficiency, as well as faster delivery times and more competitive pricing. Conveyor Components BV was founded in 1986, initially trading in drum-motors, conveyors and components for flow tracks. The first establishment of Conveyor Components BV was in an old trading building in Sprang-Capelle. The company wanted to start its own production, and needed more space to do so, so it settled at the harbour of Sprang-Capelle. In 1988, various developments in machinery and products were introduced, which led to Conveyor Components BV becoming a full production company. In 2010, Stas BV became a founding member of the Esch Group along with HTEC solutions and Conveyor Components, which together fully compliment the range of specialized products and services available today from the international group. Subsequently the Esch Group has grown to become a major player in the global roller-conveyor market for the logistics and freight industry and in recent years has made a major investment in the purchase of nine state-of-the-art CNC lathes, as well as completely re-designing its extensive production facilities. The latest investment also included high-tech machinery for turning, milling, sawing and automated assembly lines. Today the company operates two major manufacturing facilities in the Netherlands, one in Hoorn and the other in Sprang-Capelle. The Esch Group offers a diverse range of driven and non-driven cylindrical and conical conveyor rollers for a diverse range of cargo machinery and peripherals. The company’s expertise in the development of tailor-made rollers and linear systems sets it at the top of the market. Rob Verdoren, the company’s managing director, said, “Our high-quality conveyor rollers are divided into three distinct product groups: standard, custom and high-volume. These are all made to drawings supplied, or are fully customized with the DIN standard to suit individual customer requirements. “We also supply non-driven rollers and ultra-smooth-running rollers for heavier applications. In addition, we produce belt and chain driven conveyor rollers, tapered rollers and coated conveyor rollers all to the highest standards and using the most advanced, high-tech production methods. We pride ourselves on being able to meet any conveying challenges and our innovative products are designed to provide optimal running and long service reliability. Our rollers are available in steel, aluminium, plastic, galvanized and powder coated variations depending upon the customer’s requirements. “Our rollers are used for a wide range of associated machinery and we ensure that the products are flawlessly transported from A–Z. We also advise our clients on the optimal type of rollers required which are specially designed to suit their particular sector. The Esch Group produces a wide range of roller and bearing related products and these are shipped to major companies and converters worldwide. In addition to roller conveyors and bearing products, the company also designs and produces drums and drum motors. These offer many advantages to customers as part of the company’s broad product range and a special feature for cargo companies is their exceptionally compact size. In addition to its diverse variety of rollers, the company offers a comprehensive range of bearings and bearing blocks. The product portfolio includes items executed in cast iron as well as utilizing the full range of plastic, aluminium and stainless steel materials. The Esch Group also offers special, ultra hard bearings and is the exclusive stockist of the high-quality ASAHI bearings from Japan. The company is therefore able to supply the entire range of tapered roller bearings, thrust bearings, spherical roller bearings, shared bearings, rod-ends and adjusting rings from stock with fast delivery available as standard. Innovation is often cited by business gurus as being vital for business growth and sustainability. For the folks at Edge however, Innovation isn’t just in the name, it’s in the blood. Based in Northern Ireland, Edge Innovate has its own in-house design academy. Equipped with the latest 3D modelling technology and backed by local universities and colleges, Edge engineers have gained a reputation for the creation of new and inventive solutions to age-old problems. The latest piece of equipment born from the design academy is the all-new RTU2200. The ‘Radial Truck Unloader’ is a high capacity track- mounted truck unloader. The new RTU2200 will be showcased at the Hillhead exhibition in June. The Radial Truck Unloader has been developed with feedback from dealers and end users. It can be utilized in various applications and is as comfortable on the port as it is in the harsh environment of a quarry. The RTU220 provides operators with a greater efficient loading method. Designed to allow operators to continuously load directly from trucks into train wagons or barges. The full HMI control panel and remote control functions provide operators easy control of the RTU functions whilst loading. The panel interface provides easy fine tuning for accurate application performance. The HMI allows for automatic start/stop operation and provides visual data output such as engine load, hydraulic oil temp and fuel consumption displayed while the machine is still operating. The RTU220 is an independent track-mounted unit that provides flexibility and reliability. Powered by a Cat4.4 96KW (129BHP) diesel engine, the RTU220 offers huge torque whilst only consuming 12–15 litres per hour (3–4USG). Further cost savings are provided by a dual power option allowing the RTU to be tracked into position and then connected to on-site three-phase electrical supply to power conveyors at a higher level of efficiency. The machine has a range of applications but is specifically designed to receive material from lorries and dump trucks. The RTU can accept a full 20m3 (26yd3) load. Its high torque drive system allows the speed of the conveyor belt to be adjusted meaning the output of the machine can be regulated. Further applications include material stockpiling, and loading of ships, containers and railway carriages. Material is fed into the RTU220’s large 20m3 (26yd3) hopper and is carried to the radial conveyor via the 2,200mm (87”)-wide heavy duty belt. Full length impact bars prevent belt sag thus reducing material roll back and prolonging the life of the conveyor belt. Variable belt speed via the HMI control panel controls the flow of material to the Radial conveyor. The massive 20m3 hopper capacity increases cycle times and increased on-site production. With dual access, hydraulic flared sides, the RTU hopper can be fed directly by wheel loaders and grab cranes. Unlike feeder belt systems driven via a drum roller, the RTU220’s sprocket and chain design ensure against belt slippage or stalling. The RTU has the capacity to convey at 750tph [tonnes per hour] (826 US tons per hour) with a maximum feed size of 600mm (23”). Material is stockpiled via the 1,200mm (48”)-wide radial product conveyor which provides a discharge height of 6,800mm (22’4”). The 180° radial function enhances the flexibility of the RTU allowing it to be utilized in a number of applications. The hydraulic folding head section allows for quick transition from transport to operating position. All Edge products are designed, manufactured and built in a new state-of-the-art manufacturing plant based in Ireland. With a strong focus on quality assurance as a result of decades of experience, Edge products are leading the way in the materials handling and recycling equipment sectors. The Edge material handling portfolio boasts a wide range of mobile conveying systems that includes the MS-Series (mobile stockpilers) the TS-Series (track conveyors), the RTS series (Radial Track Stockpiler), the FS-Series (Mobile/Track Feeder Stockpiler) and new LTS-Series (low-level track stockpiler) launched in 2013 along with the 360° Unlimited Range. This growing range of equipment caters for the various needs of a rapidly growing customer base with a wide range of applications including rail loading/unloading, construction and demolition waste (C+D), sand and gravel, compost, topsoil, wood waste, mulch, scrap metal, aggregates and coal. Edge Innovate’s mobile conveying range has been developed through close collaboration with equipment re-sellers and end users. In many applications an Edge stacker can eliminate the need for a wheel loader and often removes the need to double handle material. There are therefore clear advantages in terms of reducing operational costs from investing in Edge equipment. The benefits of mobile solutions are becoming more and more apparent to people in the industry, with port and quarry managers recognizing the mobile option as being a viable cost saving alternative to fixed installations which in some instances are required to pass through lengthy planning control procedures. The staff at Edge Innovate are constantly striving for innovative solutions. New product ideas regularly make their way to the marketplace. At the start of 2013, Edge launched the new patent-pending LTS Series. Boasting a discharge height of up to 10.3m and stockpile capacity of up to 1,718m3, the LTS has proved hugely successful and many units have been exported to over five countries since its launch. Its robust design, available in conveyor lengths from 50ft to 75ft, enables it to convey heavy aggregate such as oversized iron ore whilst providing the customer with superb manoeuvrability around site with rapid set-up times. There were further additions to the product offering in June 2013 with the launch of the new 360° Unlimited Series. Two customized LTS 360° units along with two FTS 360° units were successfully installed and put to work in a heavy duty iron ore application just outside Sao Paolo in Brazil. By allowing the user to rotate an LTS or FTS through 360° without stopping, the 360° range maximizes operational efficiency in several applications including loading of ships, trains and barges. This unique design enables the operator to position the tracks parallel to a vessel or train, allowing the stockpiler to travel along the side of the vessel or train without the need to adjust the orientation of the machine. This option still only requires one operator to run an entire stacker that will offer up to 1,000tph for continuous loading. Edge Innovate is exhibiting its wares at the world renowned Con-expo Show, at the Las Vegas convention centre from 4–8 March, and will be showing a selection of its product portfolio including: the Slayer XL, an LTS tracked stacker, the new upgraded TRM622 Trommel and the new EDGE Roll Sizer. Aluminium rollers from Horizon Conveyor Equipment have proved to be a lightweight alternative to steel and an innovative solution to the problems of fire risk. Four years ago, Horizon Conveyor Equipment launched an innovative range of aluminium rollers that have gone on to be tested in demanding conveyor installations all over the world. But while site operators have been quick to embrace the major health and safety advantages of using these lightweight rollers, their unique design is also providing an altogether new solution to a potentially explosive problem. In hostile locations where conveyor reliability and the risk of fire are critical concerns, Horizon’s tightly sealed aluminium rollers are proving to be a superior option. Specially designed to operate at stable temperatures and cut the risk of electrostatic charges, the rollers are not only lighter but also safer than conventional steel rollers in ATEX environments where any excess heat, sparks or fire could have catastrophic consequences. Horizon originally developed aluminium rollers in response to industry concerns about the health and safety risks of using standard heavy steel trough and return rollers. Often weighing up to 90kg, steel rollers can require extra manpower and prolonged downtime to fit and replace safely, particularly in high or enclosed spaces. Increasingly stringent health and safety rules mean that operators also have to carefully consider the risks posed to personnel from steel rollers during regular conveyor running. Alan Bowler, the managing director of Horizon Conveyor Equipment, says the aluminium rollers retain the durability of their steel counterparts but boast the weight advantages, noise reduction and energy saving features that have made plastic rollers popular. Importantly, their high strength also makes them an ideal option for use on wide belts and in high impact locations. Designed using 6mm-thick aluminium tube, the rollers contain a steel shaft and sealed bearings, with the bearing housings manufactured from electrically-conductive glass-reinforced nylon. A large stationary integral stone guard forms the outer primary labyrinth seal, which prevents any spillage building up between the roller and the frame which can jam the roller. Dust, debris and smaller contaminants are kept out by a greased inner cupped lip seal together with a sealed bearing. For the past three years, the rollers have been in use at E-ON’s Kingsnorth Power Station, mainly on 1,350mm and 1,800mm belts. Clive Burfoot, materials handling engineer for E-ON at Kingsnorth Power Station, says the weight of the rollers has been a major benefit on site. While the aluminium rollers offer immediate weight gains to site operators, their unique construction delivers superior performance and longevity in high risk environments. With heavy-duty seals and sealed bearings, the rollers offer greater resilience in areas where fine dust from the likes of biomass pellets, wheat, sugar, flour and cement can be hugely damaging to standard rollers. Following its conversion from coal-power to biomass, RWE Tilbury Power Station began trialling the aluminium rollers after finding that its existing steel rollers were failing at an alarming rate. Ron Pannell, lead maintenance engineer at RWE Tilbury Power Station, said that after careful monitoring and investigation it was found that extremely fine biomass dust was getting through the seals of the steel rollers and into their open cage bearings. “Once any dust ingresses the seals and bearings, the rollers were generating excessive heat and that is a real problem with biomass dust,” he said. RWE set out to find a solution that would reduce the risk of fire through excess heat and roller failure but would also be lightweight for easy installation. Horizon’s aluminium roller was chosen for its robust labyrinth and bearing lip seals and because of its electrically conductive bearing housing, which cuts the risk of sparks and prevents metal to metal bearing contact in case the roller should ever fail. RWE’s team put Horizon’s aluminium rollers through an extensive trial, which involved running them for a period and then opening the seals. It found that there hadn’t been any ingress of biomass dust through the seals or into the sealed bearings. For Bowler at Horizon, the introduction of the aluminium roller range marks the latest development in nearly 30 years of research and design innovation. He was originally involved in the invention and patenting of the first non-metallic plastic- polyurethane rollers which were introduced into the South African market in 1980. He brought the designs to the UK and European market in 1995 and since then has established a range of steel, plastic and now aluminium rollers. Horizon Conveyor Equipment Ltd is based in Halesowen, UK. The company designs, manufactures, supplies and supports a wide range of high quality conveyor equipment including scrapers, cleaners, rollers — in steel, aluminium and HDPE (high density polyethylene) — and magnetic protection equipment for the mining, quarrying, ports and materials handling industries. TMSA Tecnologia em Movimentação S/A, is one of the big suppliers in the South American market for bulk solids material handling equipment. It is especially active in port terminals and heavy duty and long distance conveyors. It is estimated that about a third of the main Brazilian exports of grain/meals/sugar pass through TMSA’s equipment. TMSA has supplied conveyors with capacities ranging up to 20,000tph (tonnes per hour), and shiploaders for sugar, iron ore, coal, alumina, kaolin, and other heavy duty commodities ranging up to 4,000tph. a workforce of 500 (including those in the branch offices in Belo Horizonte, Sao Paulo and Buenos Aires). TMSA’s main activity is to design and manufacture bulk material handling systems — including belt conveyors, bucket elevators, rail and truck loading and unloading systems, shiploaders, dust control equipment, with associated electrical and automation systems. It is fully able to deliver EPC (engineering, procurement, construction) contracts. Troughed belt conveyor belts are the most widely used continuous transport system for bulk materials. Since its foundation in 1966,TMSA has designed and manufactured bucket elevators and belt conveyors, mainly for agro-industrial commodities, becoming the main reference in port terminals in Brazil. This equipment has grown enormously in length, installed power and capacity all while reducing specific energy consumption. TMSA has designed high capacity bucket elevators up to 2,000tph using Super Starco 4B buckets in pressed steel, stainless, HDP (high density polyethylene) or nylon, depending on the application, to handle commodities such as grains, rice, soya meals, flours, animal feed, fertilizers, sugar, cement and others. The main disadvantage of conventional belt conveyors is their limited ability to achieve vertical and horizontal curves. This ability is reduced as capacity and belt tensions increase. To solve these issues, the company has searched for innovative technologies creating a unique technological portfolio. major projects, to convey materials include alumina, fertilizers, coal and iron ore. These include the Alunorte bauxite complex, with its port terminal (see picture above, left). Another example is the VALE Carajás mine expansion (see picture top, right), which added a further 40mtpa (million probably the biggest iron ore mining complex in the world, where TMSA has recently designed and installed 44 belt conveyors with a global extension of 3.2km long, capacities ranging from 1,200tph to 10,800tph, power drives totalling 9,980CV and 6,760 tonnes of steel works. In the agro and mining industries,TMSA equipment is achieving the high capacities requested by its clients. These include truck receptions at 1,000tph, continuous railcar reception hoppers and continuous loading stations of 3,000tph, and internal link conveyors and shiploaders offering up to 4,000tph. SPECIAL CONVEYORS:A UNIQUE TECHNOLOGICAL PORTFOLIO TMSA, has developed a technological portfolio with innovative bulk solids handling systems, by developing alliances and becoming a local solution partner with worldwide technological leaders. All its systems have a common pattern: designed to minimize dust emissions, reduce environmental challenges, improve safety and reduce costs. This is a technology, developed by Doppelmayr, Austria, a world market leader in ropeways. The RopeCon® is a bulk material and unit load handling conveyor which combines the benefits of well proven technologies: the ropeway and the conventional conveyor belt. A flat belt with corrugated side walls and integrated wheel sets runs on fixed anchored track ropes guided over towers. The hauling function is performed by the belt. The conveyor system makes it possible to pass over geographical obstacles such as rivers, roads, buildings and valleys. This is a Japanese design that overcomes several problems, including spillage of material, belt training, limited horizontal and vertical curves, and limited angles of incline. The open belt passes through a series of transition idlers to form a pipe shape, making it fully enclosed for the length of the conveyor. TMSA manufactured and delivered a 2,400tph, 7,115m-long pipe conveyor to a privately owned Brazilian provider. It supplied another 2,400tph, 950m-long system, on a pier, to handle bauxite. Both of these were designed by TMSA and Bateman Engineered Technologies, under a licence agreement with Bridgestone from Japan for its JPCs (Japan Pipe Conveyors). Designed by Absam France, this is an enclosed belt conveyor with a belt sliding inside a plastic tube with no idlers, generating a natural airflow fully enclosed. It is a dust-tight technology that can guarantee less than 1mg of dust per cubic metre of air, for cleaner working area and longer lasting equipments. DSH in New Zealand, for its dust suppression hopper while loading trucks, railcars, silos or vessels. Transmin,Australia,foritslowprofile feeders, an original materials feeding system. VIGAN, Belgium, for pneumatic ship and barge unloaders. All the above, added to the long tradition of good credentials, makes TMSA a preferred and consistent supplier for market leaders and multi-national companies. These innovative technologies might replace conventional conveyor belts or not, but rather complement them under specific conditions. TMSA has the knowledge and experience for the proper selection of a conveying system which will better fit the needs and budget of each project. FLSmidth, a major supplier of equipment and services to the global cement and minerals industries, employs over 15,000 employees in more than 40 countries, writes Kenyon Sharp, Assistant Manager, Marketing Communications at FLSmidth. The group has project and technology centres located close to its customers around the world. Serving customers in the cement and minerals industries, FLSmidth offers a wide range of products, from single items of machinery to complete plants and facilities. In addition, the company also takes a full-service approach before, during and after installation; offering customers expertise in project management, engineering and other professional services. FLSmidth has been a leading supplier of cement plants for over 130 years. This extensive experience and expertise is now being applied in the minerals industry. FLSmidth’s material handling and minerals processing technology now covers the entire flowsheet. The best equipment solution can be tailored for a specific mining application such as in-pit or out-of-pit crushing and conveying, overland trough or pipe conveying, heap leach and dry tails handling solutions, and port handling facilities. FLSmidth’s crushing and conveying technologies range from fixed, semi-mobile or fully mobile solutions. A semi-mobile sizing station was just recently installed at Goldcorp’s gold mine Minera Peñasquito. This sizer station has a capacity of 12,500tph (tonnes per hour), making it the largest sizer station in the world. Currently in an out-of-pit configuration crushing waste rock, the crusher station can be moved as mining progresses. The semi-mobile crushing technology will allow for shorter haul distances and lower overall operating expenses compared to traditional plant technologies. FLSmidth is also completing installation of a dry tailings management system at a major iron ore project in Australia. The technology behind the 371m mobile stacking conveyor is well proven and there are more than 25 such FLSmidth RAHCO® systems throughout the world, operating at capacities up to 12,000tph. This system will be the first of its type in dry tailings in Australia. An area 2km × 2km (4km2) has been allocated for tailings storage. By comparison, should a more traditional pond storage system be utilized, an area of around 52km2 would be required to store the tailings the project will generate. The area required for such a pond storage system is based on a 3m-deep pond. For a fully-lined 6m-deep pond, the space requirement would be halved. However, even at 6m deep, the total area required is significantly more than that allocated for the dry storage system tailings. Initially operating at 14.6mtpa (million tonnes per annum), the system has been designed to meet the increased output from the processing plant as Stage 2 of this project comes on line. When fully operational, the mobile conveyor system will stack the tailings up to 90m high (in three stages) over a 20-plus year period. FLSmidth’s material handling equipment is present in many applications including coal, copper, iron ore, gold, nickel, cement, molybdenum, and fertilizers. Additionally, FLSmidth’s RAHCO mobile stacking systems and overland conveyors handle spent ore, dry tailings, and overburden material at many mine sites throughout the world. While there are many companies in the material handling industry that also supply similar equipment solutions, FLSmidth provides another layer of technology to enhance equipment functionality. FLSmidth’s BulkExpertTM is a patented solution that complements convectional PLC controls in stacker-reclaimer, shiploader/unloader or train loader applications. This is the only system that uses 3D laser scanning and real-time kinematic GPS technology to provide complete stockyard terrain information. Customers have realized higher equipment efficiency, reduced labour costs, and more homogenous flow rates. Lower maintenance costs and better energy utilization are additional benefits of BulkExpert. BulkExpert can also be applied to existing PLC systems that are looking to optimize stockyard productivity or move to unmanned operations. Smart FrameTM, a unique idler replacement system designed by Cove Engineering, is another equipment enhancement provided by FLSmidth. Traditionally, conveyor idlers are replaced using equipment to lift the belt and work within the confines of the conveyor structure. With Smart Frame, idlers are replaced from the safety of the walkway without lifting the belt, entering the conveyor structure or man-handling heavy idlers into position. Maintenance costs are reduced by eliminating the need for lifting equipment or elevated work platforms. Smart Frame is the safest and easiest method of idler replacement. Even though FLSmidth’s equipment covers the complete material handling flowsheet with additional technologies like BulkExpert and Smart Frame, one of FLSmidth’s greatest strengths is the people supporting the equipment solutions. Once FLSmidth has supplied equipment to a client, aftermarket support is required to keep equipment performing at optimal levels. By continuing to build relationships with clients during mining operations, FLSmidth can help develop future mine plans that best fit their needs. With clients’ needs as their focus, FLSmidth truly becomes the one source solution for their clients. Coal mining plays a major role in the Australian economy. Ten per cent of all coal deposits worldwide are ‘Down Under’, making Australia the world’s biggest coal exporter. Large deposits are found in the state of New South Wales, where the Newcastle Coal Infrastructure Group (NCIG) is based. It operates one of the most important export terminals at the port of Newcastle. A complex infrastructure is required to ship the coal from there to destinations all over the world. For the NCIG transport system, the ContiTech Conveyor Belt Group has produced and supplied several steel cord belts in recent years, helping to set up a total of three platforms. Via the project company Aurecon Hatch, NCIG awarded ContiTech Australia (formerly M.I.R.S. ), the order to set up the first platform in 2008. The Conveyor Belt Group in Northeim/Germany produced an approximate length of 10,000m of ST 1400 steel cord belt with a width of 2,500mm. It is made of an energy-saving rubber compound that has made it possible to significantly improve visco-elastic properties, thereby minimizing indentation rolling resistance on the conveyor belt system. As a result, energy consumption during transport can be lowered by up to 25%, allowing for a reduction in energy costs and CO2 emissions overall. ContiTech additionally produced 280m of type ST2500 steel cord belting for this stage of the project. It is used to transport the coal onto the freight ships. In order to ensure that the individually delivered sectional lengths were correctly spliced on-site to form a conveyor belt, ContiTech arranged a training course at ContiTech in Northeim in 2009. At it, the Australian installation partner received instruction as to the correct procedures for splicing the sections. “By doing this, we were able to ensure the best possible outcome,” says Van Leeuwarden. In the spring of 2010, an order then came in to set up the second platform. A further 8,000m of steel cord belting of the same belt types were used here. To help the team connect the individual conveyor belt lengths, ContiTech service staff members were on hand locally to set up the required vulcanization presses and further optimize the process. In 2012, thanks to the successful implementation of the first two subprojects, M.I.R.S. and the ContiTech Conveyor Belt Group also received the order for the third and final stage of the project — another 8,000m- long steel cord belt, which was delivered in several stages by September 2012. A leading Midwestern supplier of high-quality limestone to US markets is reducing costs and improving safety by using a series of innovative conveyor belt cleaners to help eliminate carryback and the problems it causes. North American Limestone Corporation (NALC) reports the cleaners from Martin Engineering (Neponset, IL) — engineered specifically for rock/aggregate applications — have been so effective that the facility no longer has service crews spend up to two hours per day shovelling and washing down accumulation from beneath the conveyors. By minimizing the need for staff to work in close proximity to fast-moving belts, the cleaners help diminish any chance of accidents or injury. Instead, by returning fines to the material flow, the company is able to reduce risk and improve overall process efficiency, saving the complex thousands of dollars in lost material and unproductive maintenance time. NALC supplies a range of limestone products from its 243 Complex in Cloverdale, IN to a number of industries in the Midwest, including fine-grind materials and high-calcium crushed limestone. The company serves customers in such diverse applications as animal feed production, electric power generation, coal mining, industrial manufacturing and various construction segments. In order to efficiently produce a consistent volume and quality level, the facility employs an expansive series of crushers, mills, screens and other equipment, with material transported primarily by conveyor. Over time, material handling system operators began noticing that a growing amount of material was being carried back from the unloading points, which would accumulate and eventually create mounds of spillage that piled up beneath the structure. In keeping with its long-range plans to employ industry best practices for bulk handling and fugitive material control in its operations, company officials conducted an assessment and contacted Martin Engineering for advice. To rectify the issue, Martin Engineering recommended the PV Primary Cleaner with TwistTM Tensioner for key locations along the conveyor network throughout the facility. The Martin® PV Cleaner is a durable, one-piece blade that contains approximately 20 percent more urethane than comparable primary cleaners, yielding a longer life in challenging service conditions. The aggressive blade angle is able to remove even wet, sticky sand from belts 18–72 inches (450–1,800 mm) wide. The PV Cleaner blades feature Martin Engineering’s patented Constant Angle Radial Pressure (CARP) design for consistent cleaning throughout all stages of blade life. The specially- engineered curved blade maintains the same contact angle, even as the belt wears, helping to retain cleaning efficiency and allow for residual material fines on the belt to be deposited back into the material flow and not underneath the conveyor. The belt cleaner and tensioner combination also helped eliminate material buildup on the return side of the belt, which could cause additional problems with the belt or return rollers. When foreign material is trapped between the belt and the pulley, it can allow the belt to slip, causing the non-carrying underside of the belt to wear prematurely. Even small particles and fines can grind away on the less durable, more easily damaged inside surface of the belt. Further, material that builds up on tail pulleys often causes the belt to wander, which in turn can damage the belt edge and/or the conveyor structure. Belts at NALC include 2-, 3- and 4-ply construction, according to the load each one is designed to carry, and they run at 100–400 feet per minute (30.48–121.92 metres per minute). Mechanical splices are used on all of them, which can be a concern with some belt cleaner designs. But the unique Twist Tensioner on the Martin design allows the spliced sections to pass smoothly, without damage to the belt or blade. Initially installed in March of 2012, NALC has found that the PV cleaner has all but eliminated the carryback and spillage. The tensioner supplies consistent pressure to keep the blade against the belt for effective cleaning, regardless of the state of blade wear, with minimal re-tensioning required. company supplies flow aids and conveyor products around the world for a wide variety of bulk material applications, including coal, cement/clinker, rock/aggregate, biomass, grain, pharmaceuticals, food and other materials. The firm is headquartered in Neponset, IL, offering manufacturing, sales and service from factory-owned business units in Brazil, China, France, Germany, Indonesia, Mexico, South Africa,Turkey, India and the UK, and under exclusive licence with ESS Australia. The cement industry is a growing market worldwide.The demand for this construction material continues, especially in China. The BEUMER Center of Competence (CoC) was established for the cement business unit to provide optimal systems and plants as a full-range supplier to customers all around the world. It is designed to optimize communication among the BEUMER experts worldwide. China’s biggest cement manufacturer also benefits from this. The factory built in Shanghai in 2006 enables BEUMER Group to provide optimal service to customers in China. More than 200 employees work on a production area of more than 13,000m2. The BEUMER Machinery (Shanghai) Co., Ltd. covers the whole logistics value chain in China from sales, project planning, engineering to production and service for the Chinese market. BEUMER Machinery (Shanghai) is even registered as a high tech company with the Chinese authorities. The acquisition of Enexco Teknologies India Limited in 2011 strengthened BEUMER Group’s presence in the cement industry. For example, the portfolio includes belt conveyor systems with horizontal and vertical curves, belt bucket elevators, heavy-duty high capacity belt bucket elevators for particularly large delivery rates and heights, and apron conveyors for clinker fitted with chains or belts as traction elements. The intralogistics specialist also provides systems for filling, palletizing, packaging and loading as well as grinding mills and silos for the Indian market. In addition to supplying the complete machines and electrical equipment for the plants, BEUMER is usually responsible for the entire process as well. This includes the design of the system, as well as the co-ordination and supervision of the installation and commissioning. “As a provider of full-range solutions, it is our goal to offer optimal support to international construction materials groups such as HeidelbergCement or Holcim for their projects worldwide”, says BEUMER expert Tissen. Therefore, the expertise of all BEUMER branches that are active in this field need to be pooled together and the resulting synergies need to be used effectively. For this, BEUMER established the Center of Competence for the cement segment. This centre is responsible for research and development, sales, project management, purchasing and above all the support of the group companies worldwide. Tissen explains that this requires smooth communication among each other, but it is worth it. The Chinese government supports large and profitable companies in order to further promote the cement industry and become a global leader in this segment. The supported companies benefit from low- interest loans, for example, or can acquire building areas more easily and quickly in order to expand further. The companies are also publicly supported when new projects are assigned. China’s market leader produces about 12,000 tonnes of clinker every day at several sites for different applications and requirements, such as Portland or slag cement. The cement manufacturer was significantly involved in the construction of various large-scale projects, for example, the Oriental Pearl Tower in the Pudong district in Shanghai. At 468 metres, this is currently the third-highest television tower in Asia and the fifth- largest in the world. Further projects include the Shanghai Pudong International airport as well as the Beijing–Shanghai high- speed railway. This is the second longest high-speed line in the world with a length of 1,318 kilometres. The company is selling its products now in more than 20 countries in North America, Europe, Africa and Asia. The manufacturer places particular value on production methods that are both energy-efficient and environmentally sound. They have been using BEUMER systems such as loading systems, belt conveyors and bucket elevators for years. “Our first order from the Chinese company was in 1995,” remembers managing director Dr. Beumer. In the meantime, the intralogistics expert has delivered and installed about 140 bucket elevators. Another important aspect of good business relations is the BEUMER Group Customer Support. The agreements with the customer can range from only maintenance and inspection to a long-term placement of service personnel on site. In order to guarantee trouble-free intralogistic processes and a value-adding material flow, the BEUMER employees ensure the modernization of the plants and systems to meet upcoming performance and technology demands. “On principle, our service agreements are specially designed to meet the individual requirements of the customer,” explains Tissen. “The service schedules as well as the reaction times are agreed upon in the contract.” The ‘BEUMER Belt Management’, for example, helps to avoid downtime through regular inspections and timely replacement of bucket elevator belts. The ‘Residential Service’ comprises technical support, preventive maintenance and inspection, emergency plans, system and process analyses and optimization as well as spare parts and facility management. “We make sure that the customers can keep pace with the increasing requirements,” explains Tissen. BEUMER Group is an international manufacturer in intralogistics in the fields of conveying, loading, palletizing, packaging, sortation and distribution technology. Together with Crisplant a/s and Enexco Teknologies India Limited, BEUMER Group employs about 3,700 people and has an annual turnover of about €512 million in 2012. With its subsidiaries and sales agencies, BEUMER Group is present in many industries worldwide. The importance of minimizing spillage and dust is crucial to the productivity of almost any bulk handling operation. Conveyor systems with inadequate material containment will regularly experience costly downtime, cumbersome clean-up and a high incidence of workplace injuries. According to the US Mine Safety and Health Administration (MSHA), 39% of conveyor-related accidents occur while cleaning or shoveling around conveyors. Now, more than ever, operators need to focus on improving efficiency, safety and productivity at today’s coal mines, coal preparation plants, bulk shipping terminals, and coal-fired power plants. Good housekeeping and dust and carryback reduction are increasingly important. In today’s bulk material handling facilities, it is important to keep dust and product spillage in the load zone area to a minimum. Many plants struggle to keep these areas clean, due to not having enough time or manpower to properly adjust skirt rubber or fix holes in the chutes. Upon visual inspection of many load zone areas, it is not uncommon to find coal piles in between troughing idlers and on the floor. This product material spillage is expensive because there is a cost to remove the coal and if not properly fixed the coal piles will reoccur again and again. Based on input collected from plant operators around the world, ASGCO®’s team of engineers set out to create the ultimate load zone containment system available today. ASGCO®’s Pro-ZoneTM system is a patent-pending modular conveyor belt load zone system that optimizes the seal for air/coal dust tightness on the receiving conveyor belt. This fully self-contained system is comprised of the company’s Slide-N- RollTM bed that supports the belt; eliminating the gaps found in a typical load zone with standard troughing idlers. The Slide-N- RollTM has an easy ‘slide out’ design for effortless removal of the UHMW support bars. The new centre roll design is simple to change out, just remove the retainer clips and the centre roller can be lifted out. Side guards attach to the Slide-N-RollTM frame to create a side enclosure that allows the angled hoods to be easily mounted. Hoods can be fabricated from aluminium or steel, which completely enclose the entire system. Inspection doors can be added to the hoods for quick assessment of chute conditions. Inside the Pro-ZoneTM are dust curtains and an internal splash sealing rubber system to effectively contain the coal dust. In the Midwestern United States, one coal-fired power plant struggled to contain dust and fugitive material at the load zone. The skirt rubber wasn’t getting adjusted or changed when needed; piles of coal that escaped the conveyor quickly built up all around the load zone area floor causing a serious safety hazard. The existing load zone was missing hoods, dust curtains and was rusting in some areas. All these problems together were causing the spillage and allowing coal dust to fill the air around the conveyor. ASGCO®’s team of inspectors identified the source of the containment problems and installed Pro-ZoneTM in the primary loading zones of the coal plant’s conveyors. reduce environmental impact — due to the significant reduction of airborne and fugitive dust as well as reducing product loss in the loading area. The customer has been extremely pleased with the performance of the new Pro-ZoneTM system as it has effectively eliminated product loss and dust, making it far les susceptible to costly fines and workplace injuries. There are several key components of a well-designed conveyor system such as primary belt cleaners, wash boxes, and secondary belt cleaners, but few have been as innovative as the new Pro- ZoneTM load zone system from ASGCO® ‘Complete Conveyor Solutions’. Proprietary technology and practical application has quickly proven to yield immediate results for bulk handling operators worldwide, in a variety of industries. Founded in 1971, in Allentown, PA- USA, ASGCO® ‘Complete Conveyor Solutions’ is recognized as an authority in bulk conveyor material handling systems. The company is focused on developing cost-effective and technologically advanced products, specifically designed for optimum conveyor performance and continues to strive to make the handling of bulk materials cleaner,safer,andmoreproductive.ASGCO® hasestablisheda global network of distributors and representatives around the world, located in Mexico, Brazil, China, Peru, South Africa, Canada and Chile. Conveyor belts are as important for the bulk industry as veins are for the human body. Therefore, proper ‘housekeeping’ of conveying systems keeps these ‘veins’ clear, and keeps your blood pressure down. Conveyor belts transport bulky or powdery dry raw material to the production area or to the stockyard or silos. Every service and maintenance manager knows that it is important to ensure that conveyors can run 24 hours a day, and that it is essential to have a cleaning system that efficiently removes the bulk material that falls off these conveyors. All those in the bulk industry know that even the best covered conveyor is not able to retain and transport 100% of the material that it transports over its lifetime; it is natural that, wherever bulk product is moved, there will inevitably be spillages, dust emissions, or grains that cause waste along these conveyor lines. The industry therefore requires powerful tools that limit the amount of material wasted in the conveying process. These tools must be simple to use, and mobile, so that qualified — and sometimes unqualified — workers are able to use them quickly and efficiently where they are needed. Nifilsk’s industry-focused Nilfisk-CFM brand has, for over 30 years, developed and distributed industrial vacuum cleaning solutions that combine the big material recovery containers or hoppers with efficient self-cleaning filter systems. At its core is the high vacuum positive displacement blower that can reach an 80% efficiency vacuum. This combination makes it possible to recover bulk material, or spillages, over long distances of over 100m. An efficient vacuum ‘housekeeping’ system makes it possible to remove spills from around all systems such as crushers, milling equipment like ball mills, grinders, rotary kiln and silos — easily, quickly, and cleanly. On conveying lines — in the case of horizontal conveyors like belts or screw conveyors, or in vertical conveyors like bucket elevators — it is necessary to keep the drive system, rubber belts and gear boxes clean and to avoid wear-and-tear on equipment, removing material fast in the case of unusual spills, perhaps as the result of a small accident. With the right equipment, this spilled material is not only removed, but can also be directly returned to the production process, saving money. Other applications are the cleaning of the conveyor that transports not only bulk material, but also bags in the case of rotary packers and conveying systems that transport the bags to the truck loading station. It is also possible to clean clogged screw conveyors below bag houses, and any other bulk material process. ‘Housekeeping’ conveying systems keeps older plants efficient, and also ensures that new systems perform safely and reliably. Vacuum cleaning the ‘veins’ of the production process is the best way to keep material moving, and to keep operators’ blood pressure low.